My husband and children love pepperoni as a pizza topping and a snack so they were really excited to try the new combination, Armour® Pepperoni with Cheese. This new product is a flavor explosion of high quality pepperoni and cheese in one wonderful bite sized treat. I served it to my family as a topping for whole wheat crackers along with a side of fruit for an afternoon snack and it was a big hit with everyone. We also make our own homemade pizza on Friday nights and this was a tasty pizza topper too. My husband even made a special request to pack some in his lunch for work so that he could share it with his buddies. 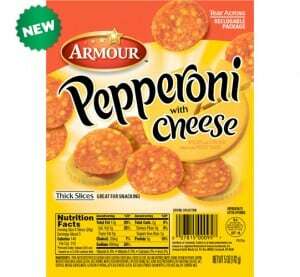 Armour® Pepperoni with Cheese is an excellent new addition to the Armour® line of premium meat products. I will definitely serve it as an appetizer at upcoming football games and holiday parties. I plan to make the Warm Cheddar Cheese & Pepperoni Dip recipe that I found in the recipe section on the Armour® website because it looks like it would be a real crowd pleaser. You are invited to connect with Armour® on Facebook or visit their website to get more information about Armour® Pepperoni with Cheese or to select your favorite free recipe ideas for dinner tonight.